All Tours in Nazca - Fly over the mysterious Nazca Lines Desert and more ..
Nazca is a nice desert town to the south of Lima, its vast plateau is home to the world-famous Nazca Lines, huge images etched on a stony desert. The images on the ground represent gigantic animals, such as fish, felines, birds, insects, plants, human forms and hundreds of straight lines. Today Nazca is considered A MUST tourist destinations in Peru. The Nazca Valley offers not only lines but amazing underground, centuries old, large cities with amazing pyramids, bizarre ancient graveyards and more. Nazca Lines Flights. Join us on this amazing scenic tour and fly over one of the greatest mysteries of our planet. Daily flight departures from Nazca city. Flight Over the Nazca and Palpa Lines. This is a COMPLETE FLIGHT over the Nazca and Palpa desert. This spectacular flight takes 1 hour. Daily flights. Land Tour to the Nazca Lines. 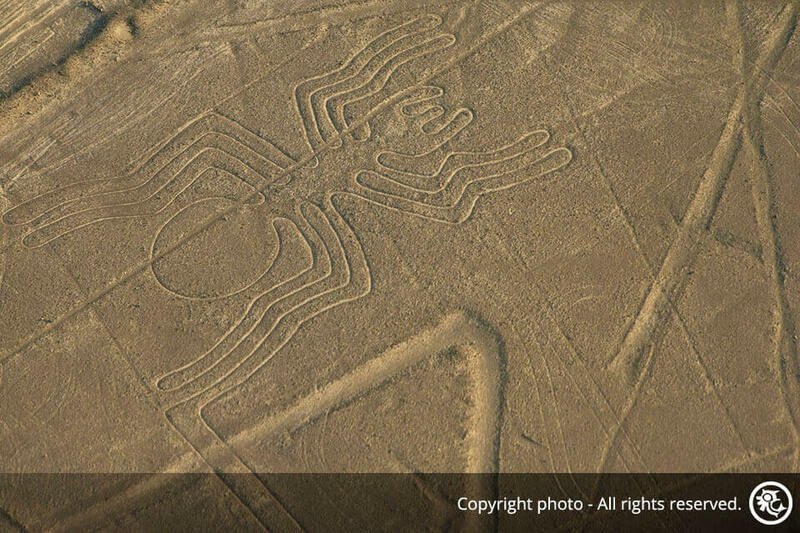 Visit the Nazca Lines desert by land and learn about the ancient Nazca mystery. We offer daily land tours to the Nazca desert. Tour to the Chauchilla Cemetery. We offer daily tours to the Chauchilla graveyard leaving from the town of Nazca. Chauchilla is a unique place in Peru. Tour to the Pyramids of Cahuachi. Visit with us the home of the Nazca Lines builders, an amazing desert sanctuary full of truncated pyramids. Daily tours. Tour to the Aqueducts of Cantayo. We offer visitors in Nazca daily tours to the subterranean channels of Cantayo. We also visit the Inca Ruins of Paredones.